Home >Forums > Politics > Lord Monckton Speaks Truth, Evicted from U.N.
Lord Monckton Speaks Truth, Evicted from U.N.
Environmental fascism rears it's ugly head in this disgraceful act. UK's Lord Christopher Monckton gets evicted from the UN climate summit and escorted from the hall and security officers stripped him of his UN credentials. "In the 16 years we have been coming to these conferences, there has been no global warming," Monckton said as confused murmurs filled the hall and then turned into a chorus of boos. The degenerate idiots booed because they hate truth and facts. They want to believe the Earth is getting warmer because humans are a cancer to the environment. They think carbon taxes will save the planet. They hate that people breath because we emit CO2 when we exhale. "From beginning of 1997 until August 2012 there was no discernible rise in aggregate global temps." 29-year old male in Abbot, Illinois, United States. Temperatures have been rising, and that's a fact. I'm all for free speech and skepticism, but this is ridiculous. Lying and libel disguised as policy is unfortunate and should be treated this way. Enviro-fascist, why do you ignore facts and evidence and present nothing? Do you gain from the carbon tax or what. "The figures reveal that from the beginning of 1997 until August 2012 there was no discernible rise in aggregate global temperatures. This means that the "pause" in global warming has now lasted for about the same time as the previous period when temperatures rose, 1980 to 1996." Darn it, I already responded to this exact article when Roy cited it a while back but I can't find my response. Lord Monckton is one right wing politician in the UK - of course climate change denial is rampant among right wing politicians because climate change is a negative externality problem that requires government intervention (or even international intervention) to solve. The facts that the earth is warming and that humans are significantly contributing to it are not matters of dispute among climate scientists. The disputation lies in exactly how bad the effects of climate change will be - and they range from bad to catastrophic. The particular article in the Daily Mail was written by David Rose who is notorious for publishing misleading articles on climate change: http://www.skepticalscience.com... . His article is thoroughly debunked here: http://www.guardian.co.uk... . Bascially, what Rose did was ignore the massive amount of warming happening in the ocean, where over 90% of warming takes place and looked at surface air temperatures only. Even considering only surface temperatures, there has been warming but Rose fudges the data by claiming natural variability accounts for the warming when it actually doesn't. Quote: " Nuccitelli et al. (2012) considered the warming of the oceans (both shallow and deep), land, atmosphere, and ice, and showed that global warming has not slowed in recent years "
"Even ignoring 90+% of global warming and only considering global surface temperatures, they have warmed 0.4"C over the past two decades, according to HadCRUT4. Swanson et al. (2009) examined the role of natural variability on global surface temperatures and found that it rarely exceeds 0.2"0.3"C, and averages out to approximately zero over longer timeframes"
btw, looking into it, Monckton is actually a fascist of the exact sort you should hate Geo. He supports blood testing the entire population of the US and the UK for AIDs and forcibly imprisoning anyone who carries the disease. The debate is not over how bad it is, the debate is over whether or not we affect it at all. Derp. Stop acting like all th evidence is on your side, and all there can be no disputation of it. It's not, and there is plenty. This is utterly absurd. The major scientific institutions in the world all believe humans are 'cancer' to the world? I believe the earth is warming and that humans are in large part responsible for it, and I also think that humans, the free market, technology and industrialisation are all incredible things. I think humans are the most important thing on the planet. I don't even think that CO2 emissions pose a threat to the environment - the planet will get along just fine with 4 degrees higher temperature. It's people, including people in undeveloped countries who have done nothing to cause the crisis, who will pay the price for climate change. atmospheric concentrations of greenhouse gases "
and nitrous oxide " to rise well above pre-industrial levels. ....climate change denial is rampant among right wing politicians because climate change is a negative externality problem that requires government intervention (or even international intervention) to solve. I don't think that admitting the existence of global warming (or even the existence of possible negative externalities) necessarily justifies the use of government intervention. It's certainly possible to think that in principle, a perfect government could do good things while denying the likelihood of that ever existing in reality (via unique public goods problems that government itself runs into). Also, there is no dispute at all over whether we affect it. The physics of CO2 heat capture are well understood. Even the most skeptical climate scientists agree that some degree of heating will be caused by CO2 emissions. There is also evidence that the Middle Ages were actualy hotter than now. The Earth has climate change, but its barely affected by us at all. Simple, relatively predictable cycle, that spikes throughout history, goes really low, spikes, ect. Nothing special. "Over 650 scientists have put their names to a US Senate Minority report that challenges the contention of the UN's International Panel on Climate Change that there is a scientific "consensus" on the causes of global warming. In comparison, twelve times fewer -"just 52 scientists - participated in the much touted IPCC Summary for Policymakers meeting in April 2007. Climate scientists allied with the IPCC were recently"caught citing fake data to make the case that global warming is accelerating. The new Senate report will feature new peer-reviewed scientific studies and analyses refuting man-made warming fears." "there is only one way to stop AIDS. That is to screen the entire population regularly and to quarantine all carriers of the disease for life. Every member of the population should be blood-tested every month ... all those found to be infected with the virus, even if only as carriers, should be isolated compulsorily, immediately, and permanently." See the above post. Do you trust wherever you got that information from over the publicly reported claims of every national science organisation in every major country in the world? "I am a skeptic"Global warming has become a new religion."" - Nobel Prize Winner for Physics, Ivar Giaever. "Since I am no longer affiliated with any organization nor receiving any funding, I can speak quite frankly".As a scientist I remain skeptical. ""- Atmospheric Scientist Dr. Joanne Simpson, the first woman in the world to receive a PhD in meteorology and formerly of NASA who has authored more than 190 studies and has been called "among the most preeminent scientists of the last 100 years." Warming fears are the "worst scientific scandal in the history"When people come to know what the truth is, they will feel deceived by science and scientists. ""- UN IPCC Japanese Scientist Dr. Kiminori Itoh, an award-winning PhD environmental physical chemist." He was an adviser to Margaret Thatcher, of course he has some issues. But I think he's a turn coat, he probably no longer believes that. AIDs is a scary disease tho, he went overboard tho. Because governments have never acted to correct market failures? C'mon, government regulation was a large part of the fact that some US cities are no longer smoggy polluted lung disease factories. You can argue that governments aren't very effective but to deny that they've literally ever done a good thing is absurd. He went 'overboard'? You're seriously willing to give him a pass on this because he happens to agree with your position on climate change? I didn't say that man. I'm saying that just positing that there are some instances in which a government could theoretically be helpful doesn't in itself justify government action or the need for a government at all since you either have to explain away the tons of bad stuff governments do and have done since their inception or ignore that and only support good governments (which brings us around to empty hypothesizing). Cool story. Not going to respond to the refutation of your daily mail article then? I've seen lists like this before constructed in support of creationism, and they usually contain scientists unrelated to the field in question and get people to sign based on a vague notion of 'dissent' that really equates to proper scientific skepticism of everything. A quick search on the web reveals that at least some of the quotes are misleading at best. One of them is quoted "Since I am no longer affiliated with any organisation nor receiving any funding, I can speak quite frankly " As a scientist I remain sceptical." But the full quote is "What should we as a nation do? Decisions have to be made on incomplete information. In this case, we must act on the recommendations of Gore and the IPCC because if we do not reduce emissions of greenhouse gases and the climate models are right, the planet as we know it will in this century become unsustainable. But as a scientist I remain skeptical." Hardly what a climate skeptic would be hoping for. There might possibly be some genuine dissenters among the crap, but the logic is retarded: "here are a minority of scientists who don't believe in human induced climate change. Even though a large majority does believe in it we shouldn't take action because I can point to this small number of people who don't". "The Club of Rome admittedly manufactured the "idea" of man-made global warming back in 1990. On page 75 of their 1990 publication entitled The First Global Revolution (http://www.scribd.com...), the organization outlined how they would manufacture ecological scares in order to manipulate the public into accepting the imposition of a dictatorial world government run by them. "In searching for a common enemy against whom we can unite, we came up with the idea that pollution, the threat of global warming, water shortages, famine and the like would fit the bill". All these dangers are caused by human intervention" The real enemy, then, is humanity itself." "We will establish a global governance structure to monitor and manage the implementation of this [global carbon tax]." It was conceded that the surface temperature hasn't increased. "In general, does CO2 correlate with temperature in climate history? The answer is often yes on "medium" timescales, but no on "short" timescales and also no on the very longest timescales of all. If one looks at all three timescales, overall observations are consistent with temperature rise causing the oceans to release part of their dissolved CO2 after substantial lag time, yet not consistent with CO2 being the primary driver of climate. A lack of correlation between temperatures (in the above from a Greenland ice core) and atmospheric CO2 becomes very apparent at that timescale and level of detail." IPCC has been caught committing fraud and having fascist agendas. A. No it wasn't - in fact the article pointed out that surface temperatures have likely increased by around 0.4 degrees. B. You've completely missed the entire refutation in the article. The point was that the vast majority of warming occurs in the oceans, and the daily mail article ignored that warming. 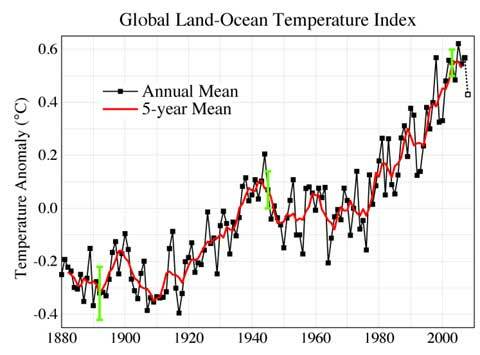 If you take into account oceanic warming there clearly hasn't been any pause in global temperature rises. Geo, your entire case amounts to one giant ad hominem attack. Finding (dubious, often out of context and sometimes made up) quotes that seem to paint the proponents of climate science in bad light does nothing to challenge the actual science of climate change. Your conspiracy theorist beliefs are blinding you to the simple truth that if the scientific establishment says X is likely true, then that constitutes strong evidence that there is good evidence in favour of X. Finding a small number of dissentors when every reputable science magazine (that I've ever seen), every national academy of science in every major country, and yes, international organisations set up to analyse climate change all come to the same conclusion that we should combat human induced climate change is a foolish red herring. Yes, there are some uncertainties regarding climate change. No, that doesn't mean that there isn't a consensus that countries should act to reduce carbon emissions.